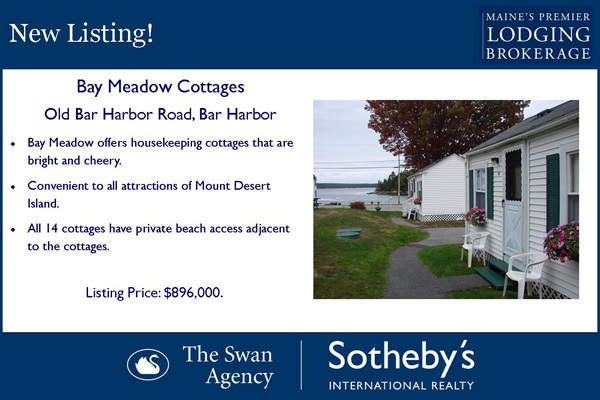 Two new listings in Bar Harbor, Maine - very popular "cottages"
Individual cottages are increasingly popular for both travelers and buyers, particularly if they've got a water view or even better, access to the water. These two businesses offer a nice revenue for the price. Contact me today. I'm happy to do a pre-view for you if you're out of town. 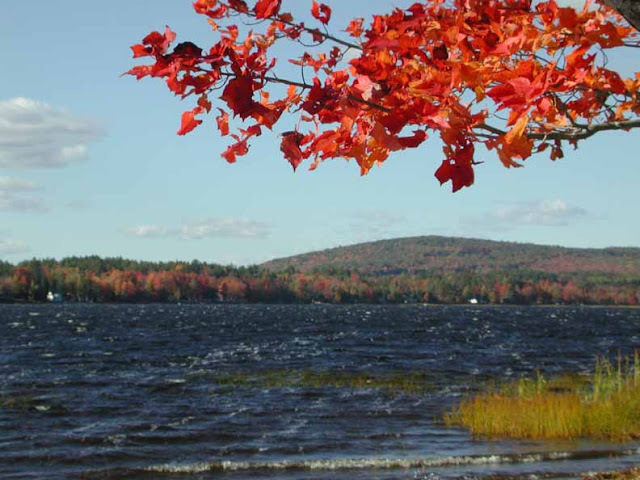 Fall Foliage Reports are in...the perfect time to come look at lodging properties for sale in Maine. This time of the year is ideal for looking at lodging properties in Maine as peak foliage is usually around October 15th - my favorite season here in Maine. 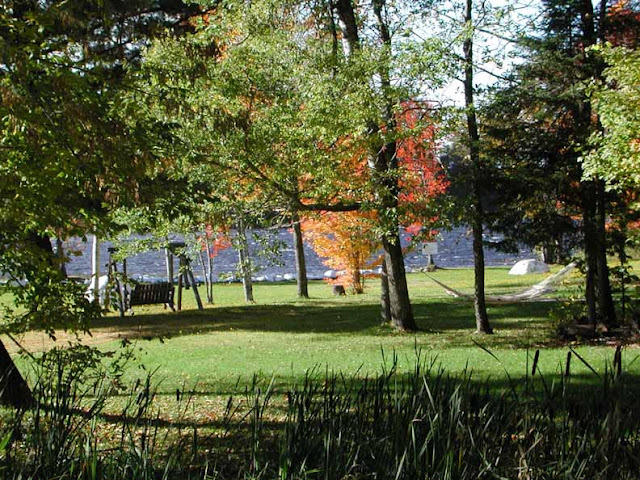 This is a great four season property with high visibility in central Maine on Route 2, mid-way between Bangor and Augusta. The property offers 5.6 acres, 985 feet of road frontage and 560 feet of lake frontage on Sibley Pond. 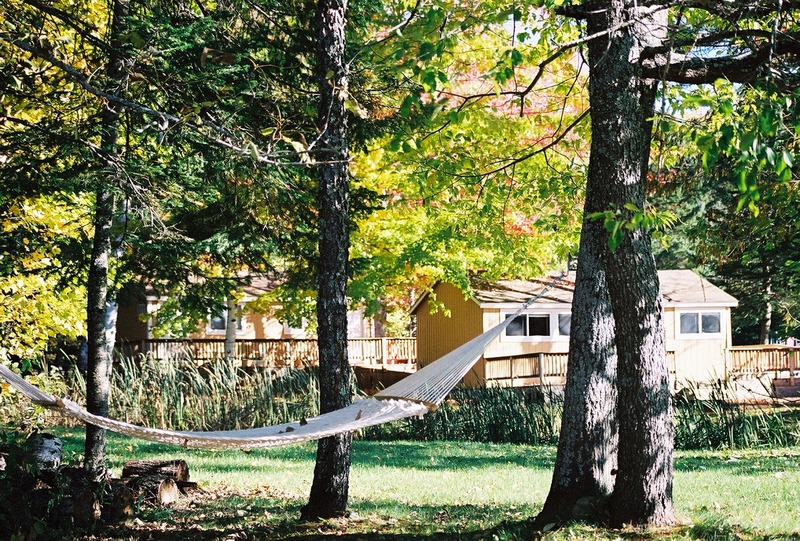 There are 4 cottages/5 units that sleep 4-6. There is a roadside cafe with commercial kitchen, walk-in, table space inside and out, plenty of space for guest privacy on the grounds dotted with chairs and hammocks. Launch a kayak, canoe or snowmobile from your private beach! More details and photos can be seen on my website. Maine's “nonperforming” loans (loans with significantly late payments) are running 82% lower than the national average. While Maine banks earn less than the national average (we give more back to customers J), only 3.5% of banks in Maine are unprofitable while 20.3% of U.S. banks are in the red. That says a lot for bank management in Maine as well. Read the story. 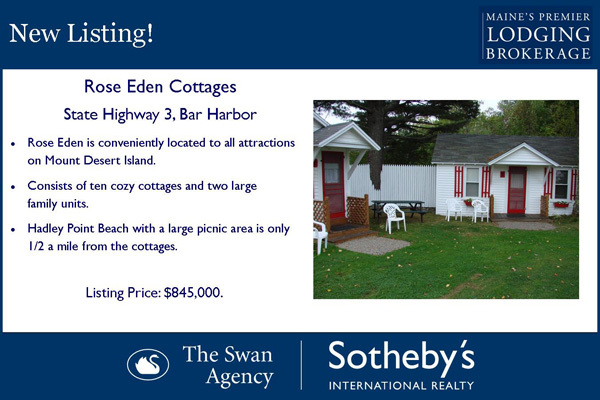 A great deal on a condo near Acadia National Park! Motivated Seller is pricing these units for today's market. Time to get in before the comeback. 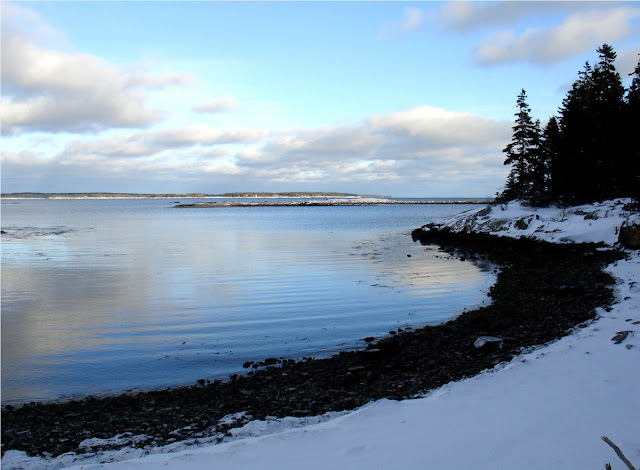 We're offering a wonderful 1 bedroom 1 bath condo just minutes from Acadia National Park. Makes a great summer home or investment rental property. Get your unit on a rental listing site by winter and get a head start on reservations for next season. Offered at $75,000, completely renovated 3 years ago, outdoor courtyard, privacy in a wooded setting. We've just put one under contract, perfect time for another! 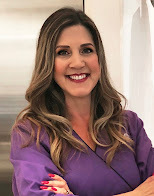 More information on my website: http://www.danamoos.com/great-harbor-condominiums.html The unit pricing on my website includes 1 year pre-paid mortgage and condo fees. Prepaid mortgage and condo fees not valid with this current offer (valid through September 30, 2010). Contact me for details. I'm headed up to the Moosehead area today to show a couple of my listings and thought about snowmobiling. So I might be a bit premature in talking about Winter sports but I will admit, I LOVE LOVE LOVE Winter. I love skiing, snowmobiling, snowshoeing, walking in the snow, you name it. For me, snow brings back childhood memories of building snow forts with my brother and dad while my mom was baking cookies and adding logs to the fire. We'd come in and eat chocolate chip cookies and drink hot chocolate with our red cheeks. I loved the days they'd cancel school, but not just to miss school, to play in the snow. So here I am in Maine, playing in the snow whenever I can. My husband and I rent snowmobiles a few times a year and play in the snow. And if I can talk him into downhill skiing (which I would love to do daily) he comes with me. I can fully appreciate a property that offers direct access to these winter sports. I've got four listings in the Moosehead region and all have trail access (there are over 10,000 miles of groomed snowmobile trails in Maine). "In addition to the positive sales tax figures, CruiseMaine USA has reported an increase of 36,000 passengers on cruise ships to Maine ports this year." 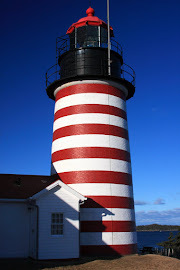 Further stated by Maine Revenue officials, sales and use tax receipts were up reflecting strong sales during the height of the tourism season in July. Gorgeous weather could have contributed as well! Hope this late summer early fall finds you well. We're just starting to enjoy cool, crisp mornings with mild afternoons in here Maine. We're working on our scheduling for our 2 day Aspiring Innkeeper seminar in Portland, Maine and wanted to see if any of you had specific requests for dates. We're looking tentatively at November 7th & 8th, 14th & 15th or if two days during mid-week, probably the week of the 7th or 14th. Once we select this seminar, we'll work on our 3-hour workshops (Art of Breakfast, Social Media, Marketing, etc.) 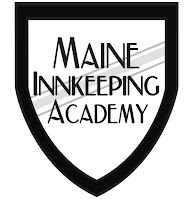 to be held at various inns in Maine. Some of you have expressed concerns about not being able to get away during the week, please let me know your thoughts or feel free to suggest dates and topics for our 3 hour workshops. We can try our best to meet your needs. Please let me know if you have any questions, input, feedback, etc.